Sochi (VNA) - Despite global and regional changes, the comprehensive strategic partnership between Vietnam and Russia has been continuously strengthened and developed for the long-term interests of the two countries’ people, for the prosperity of the two nations, as well as for peace, cooperation and development in the region and the world. General Secretary of the Communist Party of Vietnam Central Committee Nguyen Phu Trong made the affirmation at a joint press conference together with Russian President Vladimir Putin at the Botraroov Rutrei Palace in Sochi following their talks on September 6. The two leaders expressed their satisfaction at the outcome of their talks. Accordingly, the two sides exchanged comprehensively bilateral relations and discussed major orientations to deepen the Vietnam-Russia comprehensive strategic partnership, he said. They will work together to deepen bilateral political ties, strengthen strategic cohesion and improve the effectiveness of bilateral cooperation in all fields, especially economy, trade, investment, security, defence and military technique, he added. The two sides exchanged views on international and regional issues of mutual concern, agreeing that the maintenance of peace and stability and intensification of mutual trust are core factors to ensure the stable development of the Asia-Pacific region. Border and territorial disputes and others disputes in the Asia-Pacific region should be resolved by peaceful means, without the use of force or threat to use of force, on the basis of international law, including the 1982 UN Convention on the Law of the Sea, with the aim of maintaining peace, stability, freedom, security and safety of navigation and aviation in the region, he said. 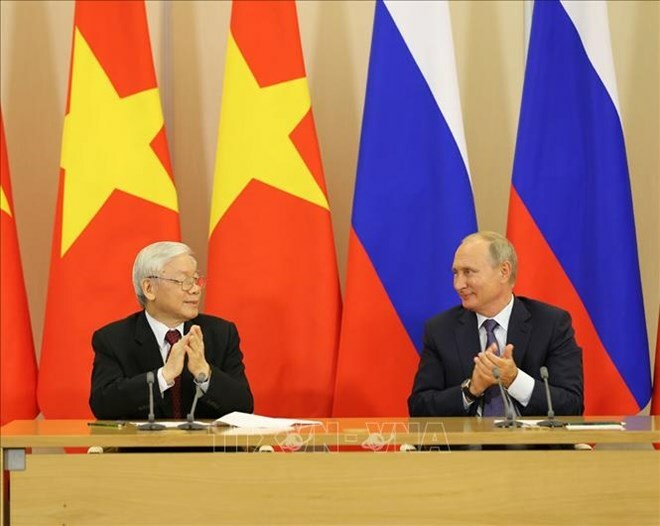 President Putin stressed that Russia and Vietnam have especially important relations and the two countries have maintained regular political dialogues. The talks took place in a candid and constructive atmosphere with the participation of senior officials from ministries, departments and major groups of Vietnam and Russia, he said. The two sides discussed bilateral cooperation in all fields. Russia and Vietnam are comprehensive strategic partners and that relationship has been incessantly growing based on mutual respect, equality and strategic benefits, he added. The two nations have continued collaboration across the board and maintained close coordination in the international arena. This is particularly meaningful since the two sides share the same viewpoints in various fields. Russia and Vietnam have also paid due attention to developing economic and trade relations through the implementation of the free trade agreement between the Eurasian Economic Union (EAEU) and Vietnam along with deals reached by their leaders. Both nations have expanded the exchange of goods of their strength and increased the turnover of commodities with high volume of technology in addition to supporting the implementation of joint investment projects, enhancing cooperation in such potential fields as oil and gas, energy, metallurgy, transportation, light industry, agriculture, science and technology. President Putin said the talks took place in a pragmatic and effective manner. The official visit to Russia by the Vietnamese Party leader has created a new momentum to deepen the bilateral multifaceted cooperation.